Summer flew right by and once again it is the busiest time of the year, the back-to-school season! In just a few short weeks these kiddos are going to be back in class -- enjoying a whole new school year and getting their education on. Luckily, all of our kids attend the same k-12 school, which means that our mornings are not as crazy as they could be, like when I was dropping kids off at three different schools. But even so - our mornings are just like any other household's weekday morning, hectic and stressful. Our school does not offer a lunch program. That means that on the daily, we have to pack 5 snacks and 5 lunches, plus some extra snacks for walking home or the after school program. That's a lot of lunch and snack prep! Today I am sharing just a few tips for making lunch and snack prep a little easier for you, the person that has a long list of to-do's, every single morning. The first tip for keeping school lunches and snacks fun and easy for kiddos is to pack them in a cute lunch bag. One of the best things about going back to school is new school gear, and that includes and fun lunch bag! Letting the kids pick their own lunch bag allows them to let their personality to show through and they will be happy to reach for their lunch bag several times a day. Purchasing cute and colorful containers and ice packs are another way to keep things fun and fresh for the kids. Two snacks and one lunch per day, for an entire year can get pretty tedious. Changing up the contents of their lunch bag goes a long way to keeping kids from getting bored. Pack the main lunch bento-style so no time is wasted opening up packages, especially for the little ones. Here I try to change up their daily sandwich and fruit, while always including something crunchy and yummy like Snyder’s of Hanover pretzels. These are some of their favorite pretzels and the mini size is perfect for packing in a lunch box. Snyder’s of Hanover has been America’s pretzel bakery since 1909. With simple ingredients and robust flavor, Snyder’s of Hanover pretzels are always in our pantry and they make a great addition to any lunch bag. Nothing livens up a lunch more than the hearty crunch of Snyder’s of Hanover pretzels. Keep snack times easy for the kids by including a few packs of Snyder’s of Hanover lunch packs Mini or Sticks. These pre-packed options, make grab-n-go easy for the kids, plus the portion size is that perfect snack time amount -- they can enjoy a quick snack and then grab some playground time. These perfectly portioned 100 calorie packs of mini pretzels are made with unbleached wheat flour, in a peanut-free facility - safe for school! Each pack contains 10 100-calorie bags and make packing easy and quick. Make sure to add extras for sharing! One of the most important tips that I can share with any parent when it comes to packing school lunches is to pack what the kids will eat. It makes zero sense to pack a lunch that the kids will pick at or even throw out. These kids are in school for so many hours in a day, they need to have happy tummies if they are to concentrate and feel good. So even if it means that we have to prepare sandwiches and cut up fruit the night before, each child gets what they like. Angel likes PB&J's, Anthony likes turkey with mustard, Julius no mustard just mayo and the two girls get ham and cheese. Sure -- it would be easier to make a week's worth of sandwiches over the weekend and just throw them in the lunch bags each morning, but half of those would be coming back at the end of each day and we would have some hangry kids. When they open their lunch bag each day at school, kids should be happy and excited. Lunches are a little extension of a parents love for each child and a full kid is a happy kid. Look out for an offer in your weekly circular for a chance to save on Snyder’s of Hanover® and Lance® products starting 7/29/18 until 9/30/18. Now is the time to stock that pantry up in preparation for back-to-school. Need more ideas for packing back-to-school lunches with love? 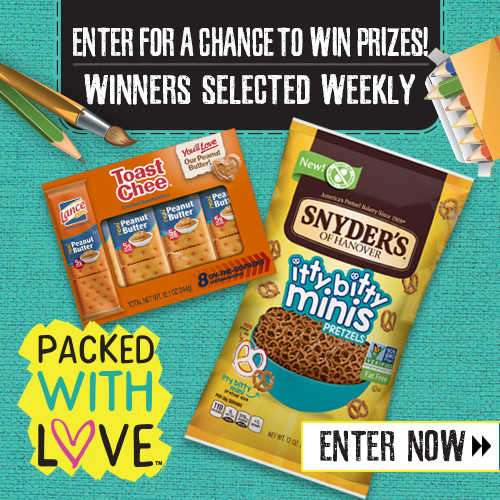 Click the image below to enter the Back to School Mega Event Sweepstakes for a chance at a weekly packed with love lunchbox prize. Prizes include: $2,500 scholarship, Laptop, tablets and more!